Despite the rise in popularity of tattoos and the glamorisation of tattoo artists, there is still a certain degree of negativity that accompanies the art form. I can even speak from experience as someone who writes about tattoo, that when I talk to people about my work they don’t really understand what there possibly could be to say about it. Tattoo for most people is nothing more than putting ink on skin, right? Wrong. If there’s one thing I’ve learned in the years that I’ve spent writing about this topic, it’s that tattoo is such a multi-dimensional art form. There is the art itself, which varies greatly from artist to artist, the community that the craft builds and strengthens and the artists themselves as individuals who regularly exceed expectations of what tattooists should be. Here at Tattoo Blog, I’ve given numerous examples over the years of tattoo artists with heart, who perform selfless acts that touch the lives of one or more people at a time. I want to make it known that if you’ve ever disputed the generosity or humanity that can exist in the tattoo community, all you need to do is go through the blog posts on this site and it won’t be long before you see something that changes your mind. Of course, I’m not foolish enough to paint all tattooists with the same brush and try to say that everyone is the same, but I know a good thing when I see one and I know that tattoo retains a strong and tight knit community atmosphere. So it is with this somewhat heavy introduction (sorry about that – once you get me started…) that I would like to present yet another kind hearted tattooist. Jason Ward lives and works in New Zealand and tattoos at a studio called Muscle and Ink. 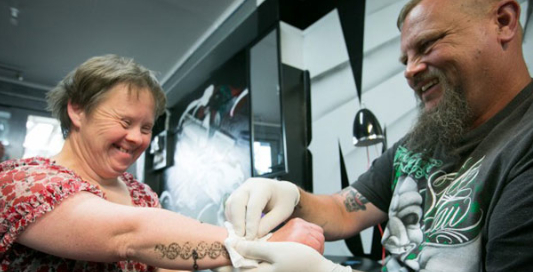 For the past three months, he has had a recurring customer in Suzie, a woman with Down syndrome who brings in temporary tattoos for Ward to apply. Ward doesn’t mind doing it and he obviously does not charge her for the effort. He adds that if Suzie were a member of his own family and had been turned away from another tattoo studio he would be angry. So now every Friday like clockwork, Suzie turns up to get her tattoos put on. The temporary tattoos are usually Maori designs. Nice guy, huh? Like Ward says, Why would you say no?